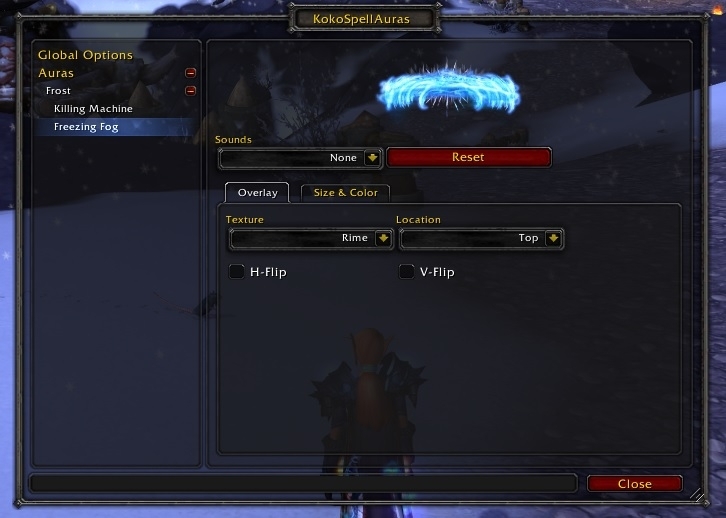 Koko Spell Auras allows you to customize the blizzard spell activation overlays (power auras) effects in a variety of different ways. Scale, color, alert location are all configurable. Dynamic detection and collection of overlays. Information is gathered as your play. Filtered by spec. Auras not associated with your current class/spec are hidden. Q: Why is there nothing to configure? A: The addon has not yet collected any spell auras. Cast your spells to trigger the Spell Auras. Once collected (and out of combat), you will be able to configure the auras. Q: I changed spec, why can't I see my previous auras? A: For clarity, only the auras associated with your current class/spec are visible for configuration. No information is lost by changing specs. Q: Why does the texture size values (height, width) reset when I switch between textures? A: Size settings (height/width) will automatically adjust to match the intended dimensions of the newly selected texture. You can still override the size if you so wish. Q: Why doesn't 'X' talent proc show? A: This addon only allows you to edit the spell alerts sent from Blizzard. 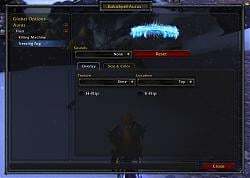 Ensure that both the addon and spell alerts are enabled for your specialization. Q: Why can't I make my own alerts? A: This addon is only for the editing of Blizzard's spell alerts. It is currently beyond the addon scope for custom alerts. - Significant code rewrite to be more modular and expandable. - Coded and implemented library control over Blizzard's overlay frame. - Fixes for calling saved data for spells that are removed. - Please delete SavedVariables if you are experiencing issues. - Now compatible with Legion Beta! - Code fix to handle the use of FileIDs in Legion Beta. - Entering combat now hides overlay frame for sizing. - Dynamic detection, no longer requires preset procs. Information is gathered as you play. - Fix for classes without blizzard procs. Sorry rogues! This looks very cool! 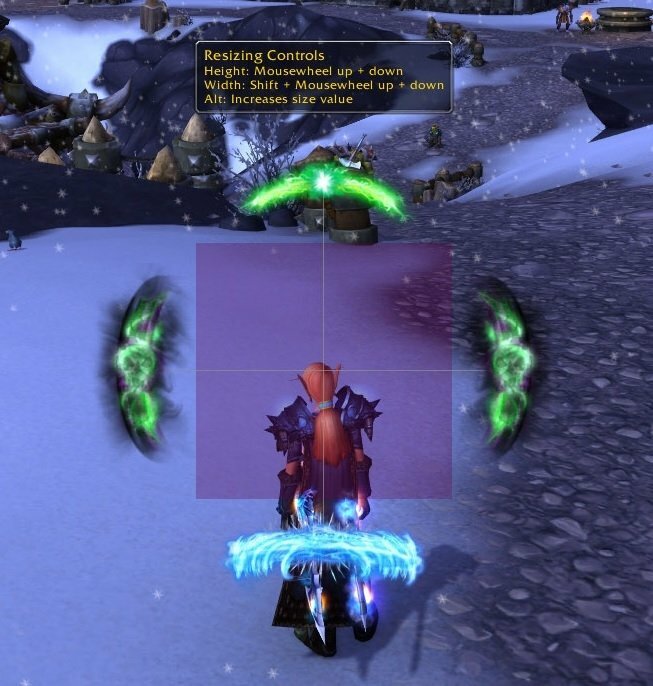 Does this add-on allow for adding an additional texture for frost mages 3rd FoF charge? Updated for a couple of bug fixes, minor code changes for better usability. Enjoy this release. I'm pretty happy with it. The SpellActivationOverlay is simply a frame, and all overlay locations are in relation to that single frame. Effectively this gives you a symmetrical alert layout, although the locations are 'fixed'. You can resize the frame, and even shift it about which is something I'm planing on adding. I would imagine nibSpellAlertConfig moves it in that manner. I've been working on something a little more fancy with this addon, and the result is I've overcome the texture sizing constraints. So you can have that texture that looks good on the top look good anywhere else as well. The bonus to this is I am able to use a similar method to create free floating anchors that you can attach any alert to. Both should be in the next release or two. Last edited by kokomala : 10-30-10 at 06:23 PM. what do you mean by not being able to position it? I know of nibSpellAlertConfig can move it, I'm just curious! Updated. The bug *should* be fixed good and proper. The intent is that if Koko SpellOverlay Sounds(kSOS) is installed, then it will use the kSOS sound settings. Otherwise the addon will use it's own sound settings/configuration. Yea, last min bug. Doh! I'll have it fixed and a new version uploaded shortly. Sorry for the inconvenience. I got this error too, then i installed Koko SpellOverlay Sounds and it works now. After installing koko spelloverlay sounds, I've been getting this error now. Last edited by Tomacco_Boy : 10-25-10 at 07:29 PM.